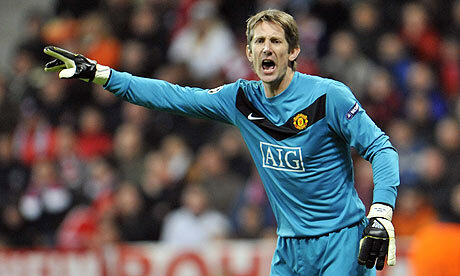 Edwin van der Sar is a goalkeeper for Manchester United in the English Premier League. He retired from international football with the Netherlands in October 2008, after a record-breaking 130 appearances for the Oranje. Edwin is one of the few players to have won the Champions League with two different clubs (Ajax and Manchester United), and is considered the best goalkeeper since Peter Schmeichel at Old Trafford. When Edwin van der Sar signed for Manchester United in July 2005, he ended a period of great instability in nets – with many trying but failing to fill legendary goalkeeper Peter Schmeichel’s boots. Fabien Barthez had looked the part at times, but at other times had failed miserably, whilst the less said about Massimo Taibi the better. Manager Sir Alex Ferguson was looking for a safe pair of hands, which is exactly what he got. Edwin’s move to United coincided with Jose Mourinho moving to Chelsea, and the Red’s leanest time in recent years. Whilst Chelsea spent big on established world-class players, United opted to invest in kids with potential, and this started paying off when van der Sar won his first Premier League title in 06/07, and followed it up with a phenomenal league and Champions League double the year after.